Alejandro Amenábar + one of the most important and tragic stories in human history = this movie. 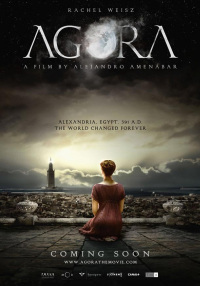 I’ve always wanted to make a good movie about Hypatia and the Library of Alexandria. Looks like Amenábar got there first. If the movie is as good as the trailer, and I suspect it is, I won’t be jealous. Just happy to have a new movie in my top 10. I don’t think I’ve been this excited about a movie since… I don’t know when. Edit: OK, let me make this clearer. To me, the Library of Alexandria is the greatest wonder in human history, its destruction one of the greatest crimes. The Library is present in much of my thinking – Hypatia herself is referenced in the introduction to Phenomenon 32, and the TV series I would like to make one day is heavily inspired by it. So I would argue that, to me, this is actually the most important story in human history. I cannot put into words how much it means to me. And the film looks good, it looks really good. You have no idea how badly I want to see it.